This week the musicians of Songfight are going to have CureFight, where the bands are going to do covers of their favorite Cure songs. In honor of the event, I figured I’d list 10 of my favorite Cure songs. They have been a very important band in my musical life. The first CD I ever bought was The Cure’s “Mixed Up” which I think was a great starting point. I’ve been a fan since my first listen and here are 10 of my favorites from their amazing 34 year career. No better way to set the tone for the entire career of the Cure then with a song like “Boys Don’t Cry”. The lyrics are simple and yet so pointed. “I tried to laugh about it, cover it all up with lies. I tried to laugh about it, hiding the tears in my eyes because boys don’t cry”. And the song is just so well done. It’s over 3 decades old and still stands up very well. This song is just built so well. Robert Smith may be plodding through lyrics like “I wish I stayed asleep today” but the groove in this song is so infectious. The version with the brass section is the best. Sometimes when you get such a powerful dichotomy between the lyrics and the music, it can be jarring but this is one of the few instances where it all comes together perfectly. The Kiss Me, Kiss Me, Kiss Me album may be best known for “Just Like Heaven” but the album includes a hidden gem in the form of “If Only Tonight…”. In a time where the band was creating bouncy new wave bits like the wonderful “Hey You” and “Why Can’t I Be You”, this song was ominous harbinger of things to come. Dark and beautiful. Disintegration is the best Cure album bar none. 12 songs and every one is full of amazing soundscapes. Robert Smith’s voice has never sounded more haunting. You can’t find a dance-y new wave song on here, instead the album went Darkwave with brilliant results. My favorite song being the faux-accordion laden “Untitled”. With lyrics like “hopelessly adrift in the eyes of the ghost again”, this song was a great inspiration to my own morose lyric writing. “Love Song” may have been the big hit coming out of Disintegration but that song does very little for me because it’s such a straightforward love song. It is rather generic, it just happens to be done extremely well. When it comes to singles from that album, my favorite is the chilling “Lullaby” where Robert Smith’s voice is reduced to a raspy whisper while Porl Thompson plays staccato guitars verses and a simple tasty guitar riff over the chorus. It creates such a cold atmosphere in the song, along with the faux strings. Wish is a great album. Some parts of it harkened back to a more poppy new wave sound with songs like “Friday I’m in Love” and “High” but they could still create lush soundscapes. Whereas “Disintegration” used faux-strings, this song had Kate Wilkinson’s amazing viola work intertwined with the same kind of guitar work that made “Lullaby” such a good song. Add in Boris Williams’ percussion and one of Robert Smith’s most compelling vocal performances and you get an amazing Cure song (a sadly often overlooked song). The Crow is one of my favorite movies of all time and one of the things that makes the movie so good is the soundtrack. Nine Inch Nails, Jesus & Mary Chain, Rage Against the Machine, Medicine and others all add great songs to the compilation. 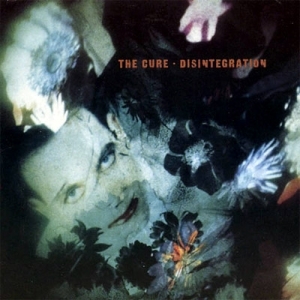 The Cure song is the lead-off track and sets a mood for the entire album. This may have been a Cure lineup without Porl Thompson but they were a band growing and finding new and fascinating was to create their sound. There are so many little touches sprinkled all over this song that make it such fun to listen to. When the Cure brings in a horn section, interesting things happen. This may have been the toughest time in the band’s history as it was basically Robert Smith and Perry Bamonte holding everything together but they were still able to make some good tunes. Granted, Wild Mood Swings, lacked some of the amazing dark tone of their previous albums but it was still a fairly good album and this song with its quirky transvestite murder video was the standout. I’m not going to be fake and say that I love every Cure album. This is very little that I like on the Bloodflowers album and coming into the self titled album, I thought the Cure was ready to fade out of the spotlight. But then there was “The End of the World”. For those looking for Disintegration, part 2, they weren’t going to find it but they got a song full of charm and was a lot more relevant in the timeframe. This wasn’t bitter and dark, but this was a band that been through all that and could find joy, even at the end of the world. This entry was posted on September 23, 2010 at 4:34 pm and is filed under 10 Shards with tags Music, Songfight, The Cure. You can follow any responses to this entry through the RSS 2.0 feed. You can leave a response, or trackback from your own site.